Warm and breezy today, thunderstorms possible tonight – Welcome to Wyandotte Daily! After a windy, spring-like day with temperatures in the 60s, Wyandotte County will see a 70 percent chance of thunderstorms returning overnight, according to the National Weather Service. Severe weather is not expected with the thunderstorms, the weather service said. Another round of storms is possible late afternoon Wednesday into the evening hours, and again, no severe weather is expected. 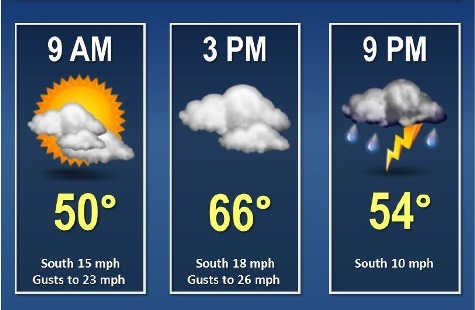 Today, the high will be near 66 with increasing clouds. It will be breezy, with a south wind of 10 to 20 mph, gusting as high as 31 mph, the weather service said. Tonight, there is a 70 percent chance of showers and thunderstorms before 3 a.m., followed by a chance of showers. The low will be around 46. A south wind of 9 to 14 mph will become light south southwest after midnight. Between a tenth and quarter of an inch of rain is possible. Wednesday, there is a chance of drizzle with a high near 59, the weather service said. A light and variable wind will become northwest 5 to 7 mph in the morning. Wednesday night, there is a 50 percent chance of showers and thunderstorms before 9 p.m., then a chance of showers between 9 p.m. and midnight, according to the weather service. The low will be around 33 with a northwest wind of 8 to 15 mph, gusting to 26 mph. Less than a tenth of an inch of rain is expected. Thursday, the high will be near 51, gradually becoming sunny, the weather service said. A north northwest wind of 9 to 13 mph will gust as high as 23 mph. Thursday night, the low will be around 27 with mostly clear skies, according to the weather service. Friday, it will be sunny with a high near 53, the weather service said. Saturday, the high will be near 59 with sunny skies, the weather service said. Sunday, there is a 30 percent chance of rain with mostly cloudy skies and a high near 57, the weather service said.